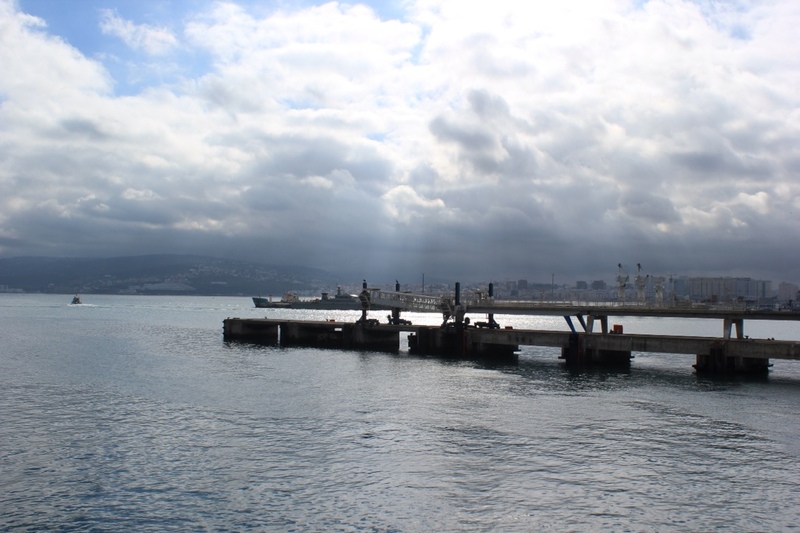 The ferry from Tangier to Tarifa was supposed to leave at ten o'clock. We were not looking to have the mad dash we had last time, so packed our bags the night before and had breakfast as soon as the restaurant opened. We had the room and all the staff to ourselves. Aside from having three room keys that refused to allow reentry to our room, (though we revisited the front desk to get them all rebooted) we had no cause to worry. The taxi took us down through the market, under the walls of the Medina, a last look at Old Tangier and dropped us at the sea front. The meeters and greeters at the ferry terminal did their best, but there is very little to offer the traveller with small cases on wheels. We could not complain, could we, when the ferry left half an hour late, but realise that it is probably an everyday event. The ferry staff must have anticipated a rough crossing, as they strolled through the seats insisting that we all take the bright blue plastic bags offered us. In the end the swell was only moderate and it was a surprise to discover people in the toilets suffering from acute seasickness. It reminded me of some pieces of artwork in Tangier we had appreciated, the pictures of refugees in flimsy boats painted on recycled paper and lolly-ice sticks. Just thinking about the people themselves in the darkness, exposed to the risks at sea with a war at their backs and who knows what ahead. How can we begrudge them even temporary respite? At Tarifa we made the bus to Algeciras. It made a pleasant change from hurtling around the cliff tops at high speed. We enjoyed the views of Gibraltar a hop, skip and a jump away from the costa del sol. It's not the only outpost of Britain here. The expats and the remains of empire. Some of the rows of red brick terraces with chimneys look more like Salford than Algeciras. It is only four hours by train to Córdoba but the contrast with Morocco is acute. 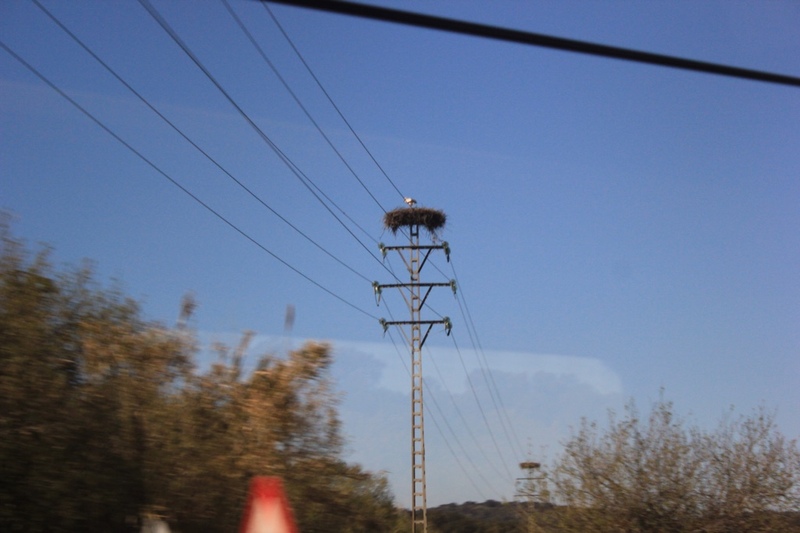 The memories are heightened by seeing white storks, lots of them, on the ground and roosting in the pylons beside the railway. Their nests are like Russian fur hats placed on top. The countryside is verdant and the soil a rich dark brown. The fields are empty and the valleys are clad in green. In the hills, huge forests cover the slopes, or lower down terraces of olives and vineyards do the same. 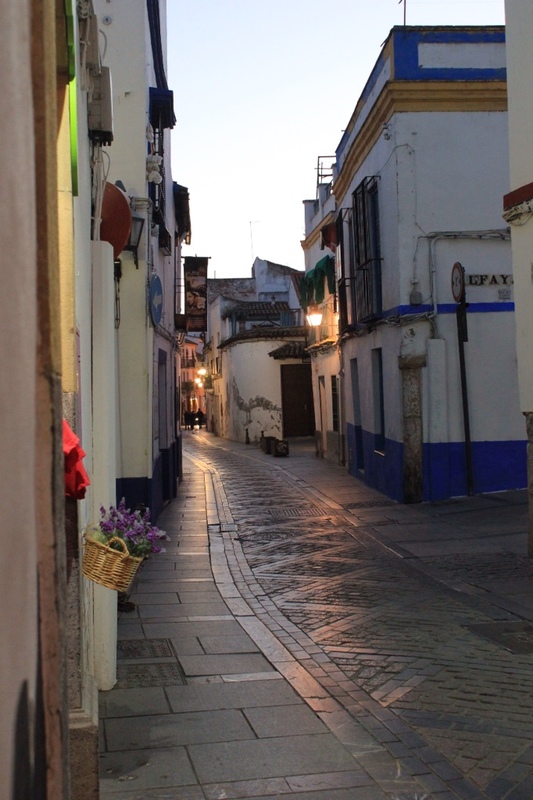 Our arrival in Córdoba coincides with the early evening, where the sun turns the light yellow stone of the old Jewish quarter a gorgeous shade of cream then orange. Our hotel, the Casa de Juifs is a maze of courtyards and balconies. Having dropped off our bags we got lost finding our way out, found some Roman remains, a series of gardens with chairs and pools and eventually discovered the exit only by asking a member of staff. Several minutes walk had led us back to within a few metres from the point we had started. If only we had taken the lift on our floor. Following directions from the hotel staff proved more accurate than our guesses and we made it all the way down to the river and along to the Roman bridge. As it was time for all good Córdobans to get out and walk around in the last of the sunlight, the bridge was positively heaving. All the more so since a flamenco guitarist had set himself up in the middle. We walked across, then decided we'd rather be in the old town so crossed back and spent the next couple of hours wandering streets, enjoying the traditional styles of architecture, the rows of terracotta pots, hanging from the walls and balconies, bursting with plants already beginning to flower. 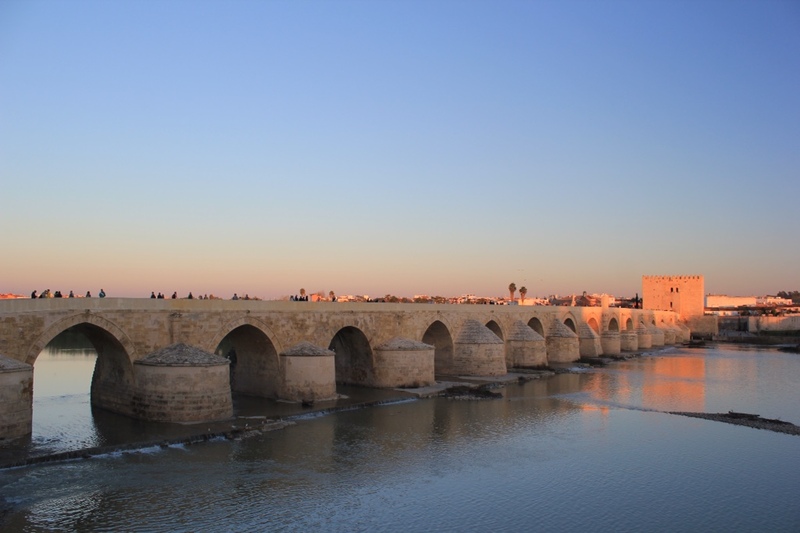 Christina had stayed for some time in Córdoba many years before. The city centre looks like it has been rebuilt in that time, but the old Jewish quarter is pretty much as it was then. The main difference being the extent to which it is now a tourism destination. In the darkness , with shops still open and cafes and bars filling up, we wandered up side alleys, watching the nighttime economy come to life, yet we could still see parents and grandparents accompanied by small children and babies in prams. How lovely it must be to live such an outdoor life. We visited a grocery shop in the streets around a large church, bought food there and then found a wholefood shop, where the owner was smoking himself to an early grave and tainting the food to boot. For a bit more exercise, since we had been sitting down all day, I left my camera lens on a pillar beside the river, where I had been doing slow shutter release pictures of the cafes in the dark. This enabled me to run a quarter of a mile back from where I had got to, to retrieve it. Despite taking many turns and choosing some directions to walk at random, we found it hard to get lost. Downhill was always going to be towards the river and once you know this you cannot convince yourself otherwise. We forced ourselves to go back to the hotel and eat our food. Time was getting on and we have an early start tomorrow. 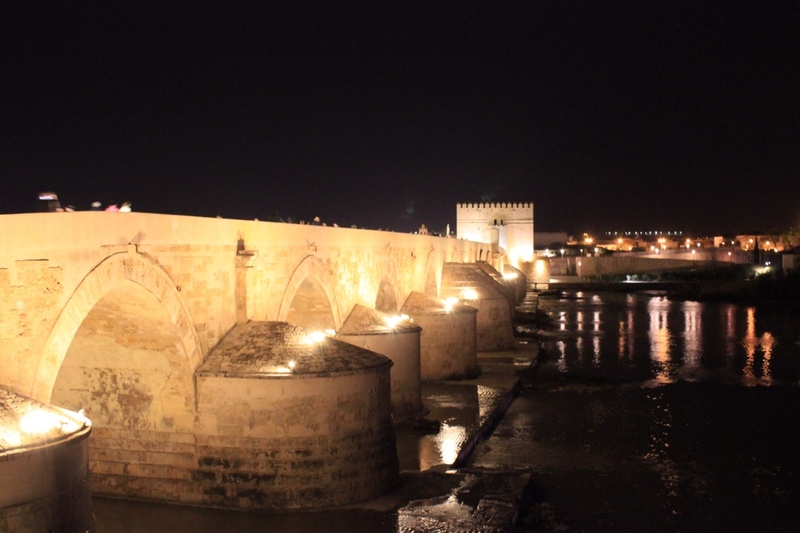 Yes, foolishly I had only allowed us an overnight stop in Córdoba. How stupid is that.